Too many young trees are pruned improperly or not pruned at all for several years. By then it may become a major operation to remove bigger branches, and trees may become deformed. • Prune to shape young trees, but don’t cut back the leader. 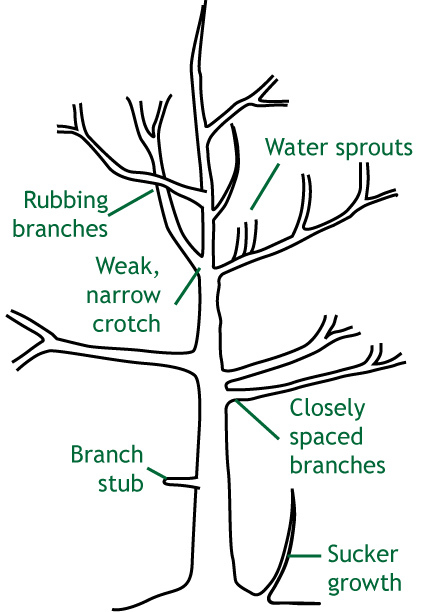 • Remove crossing branches and branches that grow back towards the center of the tree. • Remove multiple leaders on evergreens and other trees where a single leader is desirable. • As young trees grow, remove lower branches gradually to raise the crown, and remove branches that are too closely spaced on the trunk. • Trim off any branch stubs. • Cut off any suckers at ground level or water sprouts along branches. • Prune to encourage strong, even branches and crotches.